This book is by an expert in Islamic theology. It provides a clear analytical framework for distinguishing between these often-blurred categories. The author has been an expert witness on Islamic theology in over 20 terrorism trials. He is also an expert on critical realism, and the founder of Islamic critical realism. The book addresses a question that is vital for both politics and security. It provides the clearest thinking about these distinctions that I have seen anywhere. Posted 3 February 2019. Updated 17 February 2019. With the growth of terrorism committed by Muslims around the world, for well over 20 years governments in Europe, North America and indeed in Muslim majority countries have struggled with a difficult question. How do you tell the difference between somebody who wishes to commit acts of terrorism in the name of Islam, and somebody who does not? Much nonsense has been written around this subject. Some believe that the more religious a Muslim becomes, the more likely he or she is to want to commit terrorism. Some contend that such terrorism has nothing to do with Islam while others contend that the terrorists are the only true Muslims. Reading this book will enable you to understand clearly why some Muslims believe that God requires them to kill non-Muslims, while other Muslims are model citizens. It is impossible for me to be objective about this book. Apart from anything else, it is dedicated to me! Debating the ideas, and the proposed terminology, with the author on a one-to-one basis on many occasions. There are many other people also listed in the acknowledgements including a former Director of Public Prosecutions and the current Director of Public Prosecutions who at the time the book was written was the Independent Reviewer of Terrorism Legislation. I proofread the entire text twice. During the period when the book was written, I was the principal donor to the Curriculum for Cohesion project which funded its writing. The book consists of 17 pages of preface and 235 pages of text including the appendices, index etc. It is very easy to read and requires no prior knowledge of Islam. I have known Dr Matthew Wilkinson since June 2010. The great-grandson of Lord Jellicoe who led the British fleet at the Battle of Jutland, and a former head boy at Eton, he converted to Islam in his early twenties and was the creator of the Curriculum for Cohesion project. He has been an expert witness on Islamic theology in over 20 terrorism trials. In such trials, the defendant is often found with texts which the prosecution alleges promote terrorism. Meanwhile the defendant contends that these are mainstream Islamic texts. Dr Wilkinson’s task is to read the texts and give the court his expert opinion on whether or not they are genuinely mainstream Islamic texts. In a similar way, he was the expert witness instructed by the BBC in the libel trial Shakeel Begg (Claimant) v British Broadcasting Corporation (Defendant) where he had a similar role, being asked for his opinion on whether Mr Begg’s views were mainstream Islamic views or not. 8 — A second Age of Extremes or a second Age of Enlightenment? As illustrated below, this means that there are two areas of overlap, giving rise to five sets of people. Each set of people sees the world differently. The book contains detailed explanations of each of these worldviews. Below I have just given my own understanding in a few words. it is not the level of your religious practice that determines whether you fall in this category. It covers the complete range from keeping every fast and observing every prayer to hardly ever praying or fasting. It is precisely because the entire range of religious practice can fall in this category that it is wholly wrong to think that a Muslim who is more religious in their practice is therefore more likely to become a terrorist. Proud to be an Activist Muslim. People in this category share the above worldview. However, their religious beliefs also cause them to want to help mankind by getting involved both with the voluntary sector and with mainstream political organisations. The author stresses that Islamism is a revolutionary political ideology, and that it is aimed at overthrowing, rather than improving existing political structures. It seeks to replace them with an Islamic state governed by what Islamists regard as Islamic law. They emphasise the separation between Muslims and non-Muslims. This goes beyond the above category by emphasising an absolutely divided, Manichaean Us versus Them division of the world into true ideological Muslims on the one hand, and on the other hand non-Muslims and the wrong kinds of Muslims. The British and American governments have for many years expressed concerns about Non-Violent Islamist Extremism. In response, many Muslims and many on the political left have contended that there is no such thing or that it cannot be defined. In this book, the author explains exactly what it is. I have often made the point (for example in my presentation "Do Muslim religious texts cause religious persecution?" 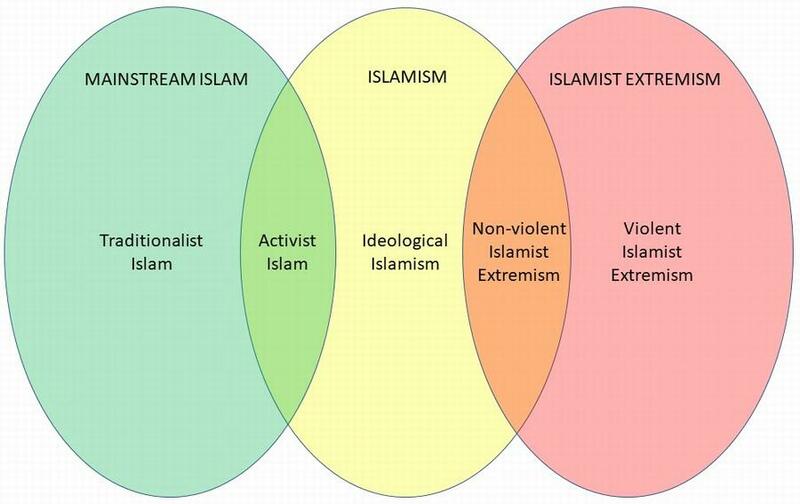 that the intellectual sources of Non-Violent Islamist Extremism are Maududi and Hassan Al-Banna. The author traces the line from them to Sayyid Qutb, looking at their writings, before going on to discuss the category below. In this most extreme category, the adherents want to bring about the ideal Islamic state by violent force, killing both non-Muslims and the wrong kinds of Muslims. As discussed on my page "Terrorism by Muslims and two opposing denials" many Muslims deny that such terrorists are motivated by their religious beliefs. The author's detailed analysis of the writings and speeches of Abdullah Azzam, Muhammad Abd as-Salam Faraj, and the others mentioned in Chapter 7, demonstrates beyond any doubt exactly how these terrorists are motivated by their (incorrect) religious beliefs. For each of the above categories, the author gives a very detailed explanations of their thinking and the key source texts that underlie that thinking. Since the 9/11 attacks, terrorism committed by Muslims, and the question of what it means to be a Muslim in the modern world, have both been of major political significance in the USA, Britain and Western Europe. Accordingly, the book should be read by everybody who cares about the goal of creating a united multi-faith country which together can overcome the poisonous ideologies of Violent Islamist Extremism, Non-Violent Islamist Extremism, and to a lesser but still important extent, Ideological Islamism. You cannot defeat something if you do not understand it.